These ‘Narrativium’ programme is the umbrella under which we engage the artistically talented members of the city, notably the upcoming generations to help us communicate important aspects of our work. The Game (aka Nine meals from anarchy? ): We developed this scenarios Game in response to the chronic stresses, long duration events and sudden shocks to the food system identified in our horizon scanning project 2017-18 (reported in our paper Back from the Future and our resultant concern that few understood the risks and resilience challenges around UK food supplies. After three pilot deliveries, we ran five simultaneous Games in November 2018 with 30 invited Players from diverse organisations. We have been invited to collaborate with several organisations about future events. Strange New World is a video, originally created as part of the suite of materials supporting The Game. 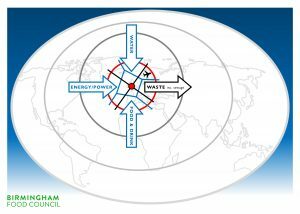 It draws the attention of the viewer to the severity of threats posed by grouping the global drivers our food supplies, thereby heightening awareness of the potential for degradations and failures within the current system. The Hand That Feeds: A musical about food crime: This musical was composed by Sara Colman and with a libretto by novelist Mez Packer, Castle Vale Community Choir along with two singer-actors, Anthony Miles and Sam Fox and two musicians, Al Gurr and Xhosa Cole (who later was voted BBC Young Jazz Musician of 2018), directed by Graeme Rose and produced by Charlotte Gregory. It has been performed in two city city venues (Birmingham Bullring and Victoria Square) and in Castle Vale. Many thousands have heard it, and extracts used in presentations. 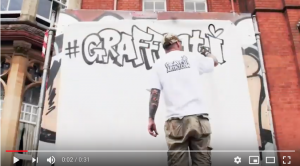 The Graffeati Project: We commissioned Panda, a Birmingham-based artist to create two live graffiti installations at the Kings Heath Dining Club Food Festival in July 2018, with the topic of food crime. The installations are portable for use at other events. Danni Ebanks-Ingram curated a video (left) of these installations as well as taking a series of images for our Instagram account. A Youth Communications programme, with an emphasis on the visual arts. 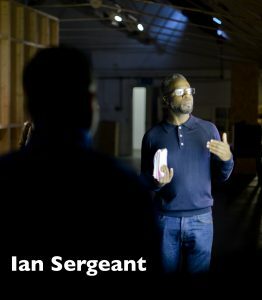 This is led by the experienced curator Ian Sergeant (see left, in this image by Marcin Sz during the launch of his exhibition, Reimaging Donald Rodney in 2016). The Graffeati Project was part of this programme. Another project which straddles both the arts and our other research work is the Archetypal Household Project. Led by Suriya Roberts-Grey, its purpose is to have memorable ‘archetypes’ representing x-% households in the city to help us explore and quantify the impact of stresses, degradations and failures in the food supply system. The artistic element will be in the production of multi-media representations of these archetypes. We are also running a feasibility study for a Birmingham, City of 1000 Meals project in collaboration with the Kings Norton-based Nationwide Caterers Association (NCASS). For us, its purpose is both a fun way to demonstrate the ‘social glue’ that sharing food generates, and generate a snap-shot record of food provenance and food culture within the city. The Elliott Review Birmingham: Our ‘best case scenario’ is coped word-for-word in Annex N of the Elliot Review into the Integrity and Assurance of Food Supply Networks: A National Food Crime Prevention Framework. The first was a writing project, One Family, Four Stories by Ellie and Keith Richards. 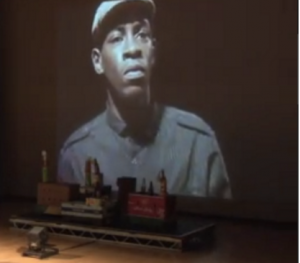 The second was a drama project, Food Futures performed in front of a live audience at the Midlands Arts Centre. It was designed and developed as a response to the Scenarios Project by four young artists, Jenny Lee, Carl Sealeaf, Katherine Hannaford and Sipho Eric Dube (image left, as a Worcestershire farmer best by floods) under the direction of Graeme Rose and with an original music score composed and performed by David Austin Grey.